Middle School students Amy T and Reese M gained some insight about what it's like to get their artwork "commissioned" as a project in Mrs. Goldhamer's drawing and painting elective. Since both art students have learned quite a bit about school counselor Mrs. Christine Lopez during the social emotional learning (SEL) classes, they were excited to take the opportunity offered by Mrs. Goldhammer to decorate Mrs. Lopez' new office space. 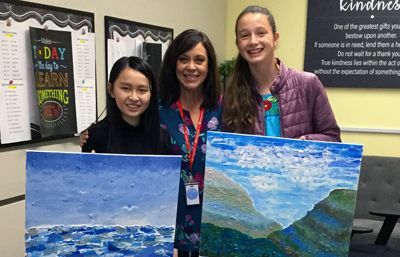 Amy and Reese were provided with a color palette from Mrs. Jeanine Chen, Pegasus parent and interior designer, and instructions given by Mrs. Lopez to create paintings that had a zen-like quality, preferably with water. Following guidance from Mrs. Goldhamer, the students used the Impasto technique, a process that requires thickly painting and sculpting with a palette knife to give an image texture. They started with an acrylic gesso medium (to give the 3D effect) and then painted with acrylics over the top. Although the medium was unfamiliar to Amy and Reese, they created stunning masterpieces and their "client" was thrilled! The Pegasus School is a coed, non-profit, nonsectarian day school in Huntington Beach, California, that serves students in pre-Kindergarten through Grade 8. A Pegasus education equips bright, motivated students to achieve future academic success and make a positive impact on society.